Megève is a small prestigious mountain resort in the heart of the Haute-Savoie located in the French Rhône-Alpes. With the infamous Mont Blanc as its backdrop, Megève is renowned for its glamour and exclusivity of the rich and famous, luxury 5 star spa hotels and chalets as well as michelin starred fine dining. This even before mentioning the fantastic and vastly varied ski terrain available, there is a reason Megève is the resort of choice for French Aristorcrats! Megève was a mere medieval market town dating back to the 14th Century before being put on the map by the Rothschild family. The Rothschild’s decided to develop a French alternative to then then popular resort of Saint-Moritz in the 1920s, making it the arguably first purpose built resort in the Alps. By 1950 Megève was one of the most popular ski resorts in the world attracting the wealthiest and most prominent figures around. To this day Megève has kept up appearances and preserved its illustrious and glamorous reputation. Having said that you will struggle to find a more authentic or traditional Savoyard village so rich in history. If luxury, good food and sophistication is your kind of thing then there should not be a doubt in your mind that Megève is THE resort for you. Being a purpose built resort it caters for everyone from those that prefer an intimate rural chalet or those yerning to socialise and party from mid-afternoon until the early hours. Megève also loves to host an event or two, the more outrageous the better it would seem… who comes up with the ludacrus idea to play polo (of the horse variety) on snow and ice….seriously. 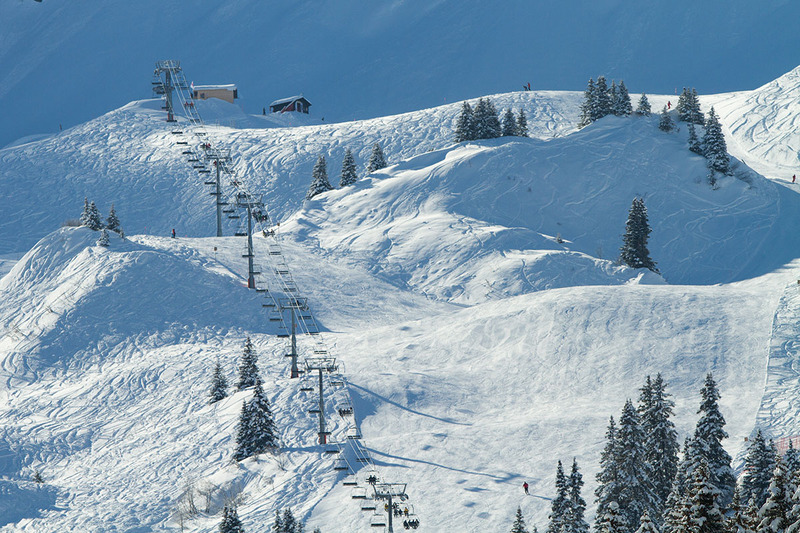 The Megève ski area is interconnected with a number of other local ski resorts (Saint-Gervais-les-Bains, Combloux, Les Contamines-Montjoie and Saint-Nicolas-de-Véroce) combining to make the “Domaine Évasion Montblanc” Ski area. This is a real bonus over its neighbouring resorts such as Chamonix which are not well connected and spread out accross the valley. This well connected area provides approximately 450km of ski piste to choose from. Megève itself hosting Mont d’Arbois, L’Alpette, Rochebrune and Côte 2000 areas. The resort unlike many other french resorts likes to invest in new lift systems each year such as the new introduction of the super-speed 6-man chair on Mont Joux, which transports you directly to the heart of the ski resort and at the door step of the newly opened Folie Douce. Megève and its neighbouring ski villages have an abundance of high quality mountain restaurants to warm you up and refuel you in luxury. You will see many quite happily eating, drinking and socialising for a VERY long lunch break without a second thought, especially at the Folie Douce where truly eye-catching entertainment, upbeat live performances and general party shenanigans on the 1958m peak of Mont Joux seems to draw in holidayers (and locals) like bees to a honey pot. The Mont Blanc Evasion Ski area caters for all standards and styles of skiing encompassing a good mix of nursery greens to challenging black runs suitable for families. There are a several snow parks and massive air bag kickers and a ski-cross course for the freestyle lovers, and a handful of designated non pisted areas (as well as plentiful off-piste if you know what you are doing) for the Freerider’s. For the cross country and ski-touring enthusiasts amongst you there are 18 cross-country skiing trails amounting over 95 km of varying difficulty and a number of signposted trails to choose from respectively. Located so close to the Mont Blanc massif the ski area benefits from generous snow cover and fabulous tree-line skiing with each valley and peak having something different to offer even though the resort itself only reaches 2500m. The scenery is not only unique due to its panoramic view of Mont Blanc itself but also the many historical monuments and farm outhouses you will pass randomly located on the slopes. Probably one of our favourite reasons to head to this resort is that the ski area is relatively quiet and you rarely have to que for a lift throughout the season (we only qued for a lift at Christmas & New Year last season). You will never be short of anything to do in Megève! The usual course of action for holiday makers is to head back to their Hotel Spa or Chalet Jacuzzi and continue the life of luxury being papered all night long. However, if a whole day swooning around the slopes is not enough for you, in the centre of the village there is a charming and elegant open-air ice rink where you can be serenaded by romantic music surrounded by prominent Sardinian architecture. Talking of the romantic side of things anyone that has been to or heard of Megève know that they love their horses. You can witness Megeve by night, under the stars in the back of a horse drawn carriage wrapped up snug under the pretty street lights. It is truelly stunning and if not anything an excuse not to have to walk home. If the adrenaline and exploration is more your thing then a range of dog sledding, paragliding and pleasure flights are on offer. You can take to the skies to get a rather unique perspective either by tandem paraglider or by light aircraft (with its on skis!) from a snowy 2000m altitude runway. For the ‘Cultralites’ among you the authentic cobblestone pedestrian streets intertwining the sites of Megève including the Baroque-style church and traditional Savoyard and Alpine museums. And last but not least it would be rude not to take a look around the Aallard department store, infamous for its elegance, sophistication and touch of glamour (included in the price tag). At just 85km from Geneva Airport typically taking just over an hour the transfer to Megeve is a short and sweet one. If your staying in Megeve itself then there is no better way to get there than by private transfer as you will not need a car due to proximity of the ski lifts, interconnected resorts and free shuttle buses running throughout the village. Also saving you the hassle of trying to park your car in the expensive and limited car parks dotted around. Peak Transfer offer private transfers to and from Megeve making sure someone is ready and waiting for you when you arrive and dropping you direct to your accommodation door. Allowing you just to worry about how quickly you can check in and hit the slopes (or restaurants). The village really take pride in this event and go all out attracting tourists and locals alike. Symbolising the start of Christmas festivities and winter the Magnificently decorated Christmas Tree taken from the local forest stands tall in the centre square. The party lasts long into the night and early hours after the lights have been switched on. Winter golf – in similar outrageous yet spectacular style Megève holds an annual golfing competition in winter the ‘Snow Golf Cup’. Figure Skating Championships & Ice Hockey – at the Palais des Sports stadium national and international competitions of both rather condracting activties take place on a regular basis. Be sure to watch if you happen to be there. To conclude Megève is a paradise for skiers whom adore that extra touch of five star style and luxery after a day on the slopes. At just over an hour away from Geneva if you love to be wined, dined and pampered Megève is your perfect match. For more information about Megève visit their website or contact the Tourisme Office.